After missing market day while I was on vacation last, I'm starving for fresh, green food this week. 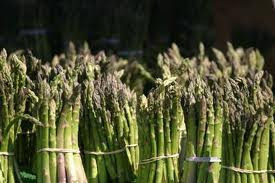 A word of warning: Don't get between me and the asparagus. The pantry is bare and I'm hungry. Grateful Growers Farm is looking for new volunteers to help with their stand at the Charlotte Regional Farmers Markets. They don't pay with money, but you do get fresh pork and other food from their farm. If you're interested, email Natalie Veres at info@ggfarm.com. The Harvest Moon truck won't be at the regional market this week. But they will have farm stands open at the regional, at Matthews and at the Bill's Freedom Farm booth at the Denver market. The Matthews Community Farmers Market has a clever event this week: "Bring a Friend to Market Day." If you bring a friend, neighbor, co-worker or a family member who is new to the market, you can enter a drawing for a market gift basket. Bring two friends and you can enter twice. Get details, hours and directions here. The Atherton Market in SouthEnd will have plenty of fresh food Saturday morning, then will host the Tony Coturri wine and chef event for Slow Food Charlotte from 6-10 p.m. Saturday night. Tickets are $50 and must be bought in advance. Go here for the details. If all that fresh food gets you in the mood to get out in the field yourself instead of shopping, the Brotherhood of St. Andrew is gleaning collards in Concord from 9 to 11 a.m. Saturday. Call Kristen Shaben, 704-577-0779, if you want to sign up. And finally -- but most importantly -- we're getting ready to run our annual list of farmers markets in the region on May 18. If you manage a market and you don't want me to miss it, please email me with the details (address, hours, web sites, email or phone number) at kpurvis@charlotteobserver.com. I have the best of intentions to get up to catch a little of the royal wedding. But that depends on what happens when the alarm goes off. 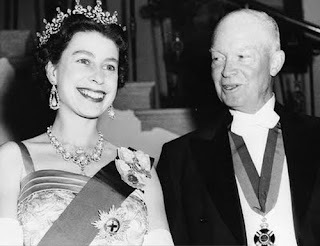 If you're up in the middle of the night and feeling kitcheny, the National Archive has released a recipe for the drop scones that Queen Elizabeth II made when President Dwight Eisenhower visited Balmoral Castle in 1959. The original, typewritten recipe card is featured in an upcoming exhibit, "What's Cooking Uncle Sam?" Wave one's hand in a queenly fashion and cause them to be made. You're on your own to figure how big a tea cup is (I'm guessing roughly 1/2 cup), but you can substitute treacle or sugar syrup for caster sugar. The directions don't actually include cooking, but apparently, the batter was spooned out onto a hot griddle. 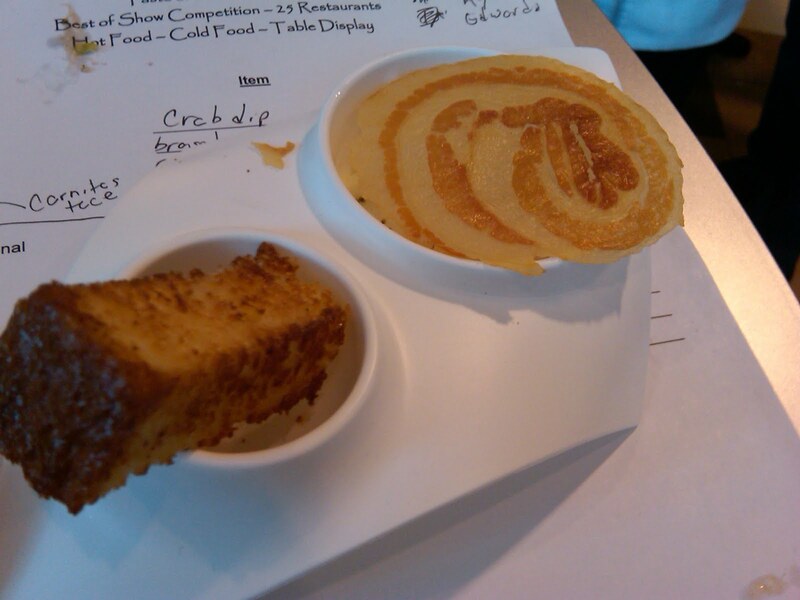 Drop scones are like thicker American pancakes. Beat eggs, sugar and about half the milk together, add flour and mix well together, adding remaining milk as required, also bi-carbonate and cream of tartar. Fold in the melted butter. 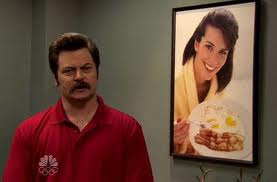 As a fan since the very first episode, I can finally declare my favorite food show: "Parks and Recreation." I'd move to Pawnee to break bread with Ron Swanson (Nick Offerman) and Tom Haverford (Aziz Ansari). Now the online food world is catching on to them, too. Remember, people: Muffins are just naked cupcakes. Eater National is reporting that Paula Deen has been diagnosed with Type 2 diabetes. No confirmation. If it's true, she has my sympathy. TV ratings are a tough game. Would anyone have watched "Paula Deen's Low-Fat, Healthful Food Party"? Further proof that the cupcake craze is over (or should be): Cupcake Vodka. It's available in four flavors (original, chiffon, frosting and devil's food). Amazing -- they've invented a vodka that gives me a headache before I drink it. In more serious news, I was vacationing last week and almost missed an excellent story in the New York Times on the risk that foragers are destroying ramps by digging too many of them. Since ramps are one of North Carolina's food traditions, it's worth a read. And in today's New York Times, science-cook Harold McGee has a fascinating piece on the taste of artisan sea salts. Kraft just announced its newest product: Jet-Puffed StackerMallows. Apparently these are flat marshsmallows, "perfectly sized to fit a graham cracker for year-round s'mores." Remember when s'mores were simple? Remember when you could do it with any ol' marshmallow, even a half-stale one that had been in the bottom of the camping gear since that rained-out Cub Scout trip six months ago? Remember when you could just cut a marshmallow in half or squish it really hard if you needed a flat marshmallow? If you need them, StackerMallows will be $1.69 for an 8-ounce bag and will be available in stores in June. So who won the random drawing for a copy of Diane Daniel's "Farm Fresh North Carolina"? That would be Susan Campbell. Congratulations, Susan. If you didn't win, you can find our list of Piedmont farms with pick-your-own crops. It's up on our web site, at www.charlotteobserver.com/food. 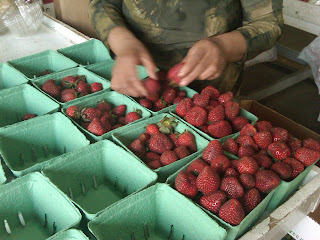 The list lasts for a lot longer than strawberry season, of course. It covers peaches, blackberries, blueberries, scuppernongs and vegetables like tomatoes and corn, and keeps going right through pumpkin season. So we keep it posted on the Web site from April through October. It's great to know how well-used it is. I call each and every farm on the list. And every year, farmers tell me that people show up with our list in hand. Stay tuned: Our annual list of farmers markets will be coming in a few weeks. It's good-food season, folks. But aren't all seasons good-food season? Ready for You-Pick -- and a giveaway? The Observer's annual list of Pick Your Own farms goes up Wednesday. We do it as a print list in the paper and online as a searchable map that stays posted through October, so it's ready for apple and pumpkin season, too. New this year: We'll combine our map with the Raleigh News & Observer's version, giving you a big net of fresh-in-the-fields food from the coast to the mountains. Along with the list this year, my Raleigh cohort Andrea Weigl is writing about a couple of books that fit the theme, "The New Southern Garden Cookbook," by Sheri Castle, and "Farm Fresh North Carolina," by Diane Daniel. Daniel's book is an unusually helpful guide to farmers markets, farm stands, orchards and farm-centric food and lodging all over the state. To get everyone in the strawberry-picking mood, I've got a copy of "Farm Fresh North Carolina" to give away. To enter, send an email with "Farm Fresh" in the subject line to kpurvis@charlotteobserver.com. Deadline: 9 a.m. Wednesday. I was honored to be invited as the guest on WDAV's Sunday morning chat, "Biscuits and Bach," with Rachel Stewart. The online link just went up, in case you weren't listening to the radio that morning. It's a sweet show -- a five-minute interlude between all the high-cotton classical music. We managed to cover lard, emotion and Southern identity. To replay it, go here and scroll down to April 10. And if you really want to hear an expert, drop down one more day and listen to Nathalie Dupree's recent appearance as well. And in another link, my friend and colleague Judy Walker, the food editor of the New Orleans Times-Picayune, was apparently so taken by our recent story on kitchen cleaning that she turned it into a video. Take a look at it here. Thanks, Rachael and Judy. I'm always honored to work with talented women. Wendy Hadley is the winner of our drawing for "Gluten-Free Baking," by Phil Vickery. Congratulations, Wendy, and thanks to everyone for playing. OK, remember that guy (above)? That's Harry Peemoeller, bread-sculpting wizard from Johnson & Wales Charlotte, and he's doing a bread-sculpting demo today from 11 a.m. to 1 p.m. in the Wells Fargo Atrium (nee the First Union Atrium, nee the Wachovia Atrium, if you've been around Charlotte long enough to be able to name every building through at least three generations of past bank ownership). That would be today from 11 a.m. to 1 p.m. Not last Friday, as I mistakenly reported here last week. Sorry. Sometimes modern journalism means "typing too fast." Vin Master will be a Charlotte wine shop in Atherton Mill, 2000 South Blvd., dedicated to organic and sustainable wines, and it celebrates its grand opening from 11 a.m. to 6 p.m. Saturday/April 16, with an open house and a charitable donation: 20% of first-day sales will go to Wine to Water, the nonprofit group that raises money to provide clean water to needy people around the world. The Charlotte Wine & Food Weekend actually isn't until next year, but it kicks off Saturday/April 16 from 7-10 p.m. with a celebration at the NASCAR Hall of Fame, 400 E. Martin Luther King Blvd. Tickets are $125 and includes wine, food and a silent auction. The Wine Shop Dilworth is holding a free tasting of Bordeaux wines with Cristophe Bedouet of Sober Wines, from 5 to 7 p.m. today/April 15, at 2442 Park Road. The Meat House, 8410 Rea Road, celebrates its first anniversary on Sunday/April 17 with 10 percent off everything in the store except wine and beer. They'll also have product samples, grilled steak tips and a hot dog cart. And finally, not getting an invitation to the Charlotte Food Bloggers meeting makes me feel a bit like the grandma who didn't get invited to her grandchild's graduation. I've written about both organizers, Julie Ruble of Willow Bird Baking and Taylor Mathis of Taylor Takes a Taste. But I'll still report that it's happening: Saturday/April 15 at 11 a.m. at Park Road Park. If you're going, take a dish to share. Have fun and stay dry, kids. The men in the white coats came to take me away Wednesday night. About time, right? It was my annual stint judging Taste of the Nation, the annual hunger-relief fundraiser at the Wells Fargo atrium. For most attendees, it's a real eat-drink-and-tarry event. For me, it's a annual spin around the room with chefs in white coats. I'm always placed on a judging team with a couple of chefs, which is always enlightening, and the chefs who are representing their restaurants are competing to top each other. Also enlightening. I almost always pick up a trend or notice something new. That's the first place I had seared pork belly, long before it became a fine-food cliche. 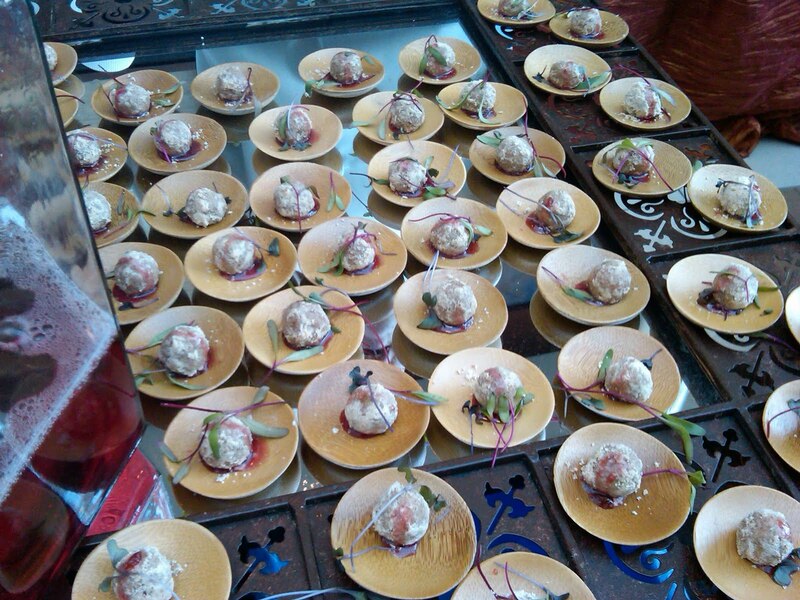 Another year, chef-instructor Joe Bonaparte led students at the Art Institute table to produce pig head. Not a crowd-pleaser, maybe, but impressive. This year? One of the winning dishes was The Gallery At Ballantyne's chicken pate (it's in the bottom picture): Softly cooked balls of Baucom's Best chicken rolled in pecans and local honey and served in a little pool of sauce made from Junior Johnson's cherry moonshine. Clever, but also wonderfully delicious. 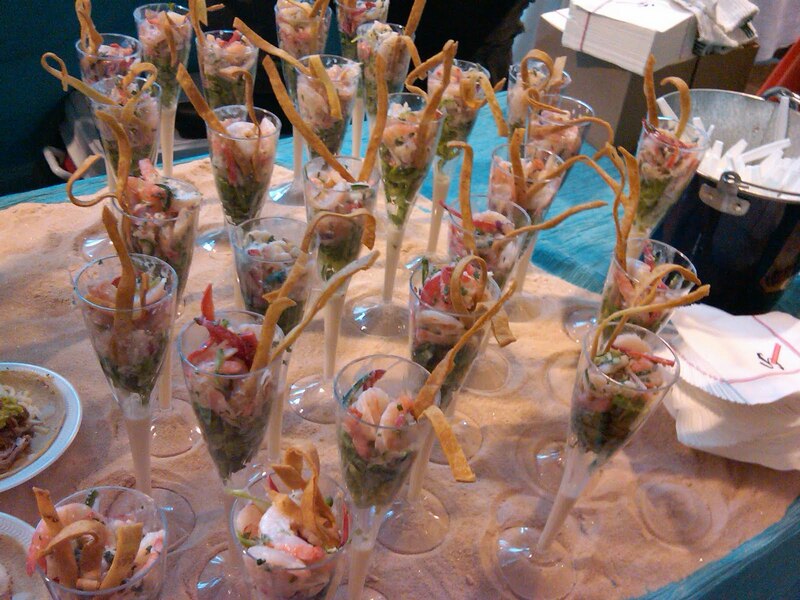 Another winner was the ceviche sushi from Enso, which also had an eye-catching display involving an ice table with their logo. Other great dishes: Gene Briggs at Blue did a beautifully cooked short-rib tagine with ginger chickpea puree and Marcona almonds, and Mimosa served a hollowed-out hush puppy filled with a spicy seafood sauce. The picture at the top is coconut shrimp ceviche from Vida Cantina, which also had subtly spiced pork carnitas served on corn tortillas from a local tortilleria. Nice touch. But here's what grabbed my attention. I was judging with AI instructor Mark Martin and CPCC instructor Pamela Robertson. At one table, I struggled to scribble down the dish name, which was one of those typical chef mouthfuls: Braised something something with a fennel puree something and a rhubarb something else. I whined to Martin, "why can't chefs name a dish without including everything down to the detergent they used in the dishwasher?" He laughed and agreed. Robertson chimed in thoughtfully, "That's changing though. Simpler is the way to go." A few tables later, we encountered the perfect example. 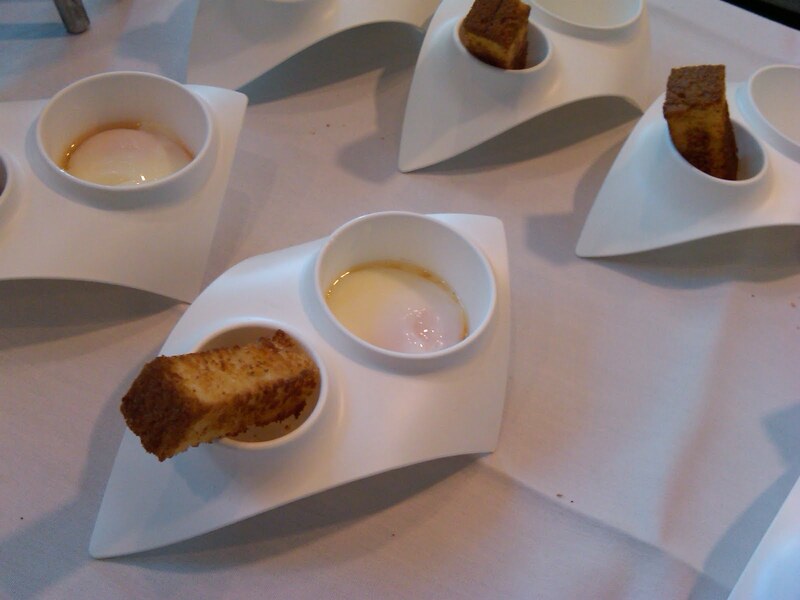 At Ember Grille's table, they were using eye-catching, two-sided bowls to serve a poached local farm egg topped with a crisp sheet of pancetta sliced as thin as paper, a Parmesan truffle vinaigrette and a finger-long strip of brioche. Gutsy move: C ooking perfectly poached eggs for hundreds of people at a folding table takes courage -- and a water circulator. Basically, it was a sous vide egg, brought up to a precise temperature so each one was perfect. When we tasted it, using spoons to break the pancetta so it fell into the egg, we were all silent for a minute, just admiring. It was simple, it was elegant, it let the egg and the hint of bacon shine. The softness of the egg and the crispness of the circle of pancetta brought texture. Nicely done, chefs. When you keep it simple, food shines. My column this morning about the rule against rare hamburgers reminded my colleague Mary Newsom of a famous entry in The Observer's annual limerick contest. 'Cause it's bad for you? You can't have a cheeseburger rare. As having a cheeseburger rare. But you can't have a cheeseburger rare. Is this meat from a moose or a mare? If you can't have your cheeseburger rare. Asheville: Best small town for food? Thedailymeal.com, the Web site started by Colman Andrews (Saveur, books, etc.) posted a list today naming picks for "9 Great Small Food Towns." To clarify, that would not be towns with small food. (That would be New York, where you get very small portion for very high prices.) No, this list is small towns with great food. The first town on Daily Meal's list: Asheville, the best-kept secret in the food world. Between the local-food mania, the incredible turn-of-the-century architecture and all those students from UNC-A and Warren Wilson keeping it lively, it gives much bigger food towns like San Francisco a run for their diners' money. Daily Meal named restaurants like Corner Kitchen, Table and Fig, but I'd also add Tupelo Honey, Early Girl and The Admiral in west Asheville. I ate at the Admiral last fall and loved it, for the eclectic setting, the wide-ranging menu and the creative cocktail list. I can also make another nomination: Everybody visits the N.C. mountains in the fall, but the spring is even more beautiful and not packed with everybody who is visiting in the fall. Not that I'm dropping a hint or anything, but if you have a weekend to spare this time of year, you ought to consider it. In the meantime, what's your pick for best small food town? Surely Carrboro/Chapel Hill deserve some love, too. The explosion of interest in gluten-free diets is astonishing. Last year, I couldn't even report on the plans for the first Charlotte Gluten-Free Expo because it sold out before I could make the first phone call. So this year, you want to get in on the action early. They've moved it to a bigger venue, at the Blake Hotel, 555 McDowell St., and they'll include speakers on celiac, gluten-free and allergen-free research, as well as product samples and information. It's 9:30 a.m.-3 p.m. April 30, and tickets are $5 in advance or $10 at the door. Register and get more information at www.charlottegfexpo.blogspot.com or email organizer Nikki Everett at irresistiblyglutenfree@gmail. While you're waiting for April 30, I also have a book giveaway for a copy of "Gluten-Free Baking," by Phil Vickery. To enter the random drawing, send an email to me at kpurvis@charlotteobserver.com and include "Gluten-Free" in the subject line. Deadline for the drawing: 9 a.m. Friday. The next time you grumble about making coffee, or complain that your office is out of coffee, or fume about stopping somewhere for coffee, watch this video. When you make coffee, it doesn't involve a cool machine gun, a boot band (whatever that is) and an MRE heater pack. I don't know if this is a hoax. But if it is, they found a backlot in California that looks mighty convincing. If it isn't, it's a good chance to think about the daily life of our hard-working troops in Afghanistan. Yes, it does amount to a free ad for Starbucks Via. But if we can send more Via to troops and make their day better, I'm all for it. Finally: It's the best use of "La Bamba" I've heard in hours. Saturday (that's tomorrow): The Matthews Community Farmers Market reopens for the season. And for forever -- the winter market was such a success, they're going year-round. Address, hours and more details: www.matthewsfarmersmarket.com. Also Saturday (that's still tomorrow): The Davidson Farmers Market opens for the season, from 8 a.m.- noon in the space next to the Davidson Town Hall, between Main and Jackson streets. Details on vendors and special events: http://davidsonfarmersmarket.org/. Wednesday, April 13: Taste of the Nation, the annual Share Our Strength fundraiser to benefit Second Harvest Food Bank of Metrolina and Community Culinary School of Charlotte. Features small plates (some of them are pretty big) from a bunch of Charlotte-area chefs, plus entertainment, drinks and a silent auction. 7-10 p.m. in The Wells Fargo Atrium at MLK Boulevard and South Tryon uptown; tickets are $85 and parking is free in the parking deck off MLK. Details: http://www.charlottetasteofthenation.com/. April 16: The First Hmong United Methodist Church Egg Roll Sale, 11 a.m.-4 p.m. at Kilgo United Methodist Church, 2101 Belvedere Ave. Egg rolls made by the Hmong women's group are $10 for a dozen or $5 for six. Walk-ins are welcome, but pre-orders are appreciated. Call Xia Her at 704-953-8650. April 30: Slow Food Charlotte event with winemaker Tony Coturri. 6-10 p.m. at the Atherton Market in SouthEnd. Features chefs making local-food pairings to match Coturri's organic wines. Tickets are $50, must be purchased in advance, and benefit the Slow Food Charlotte Farmers Fund, which brings continuing education to the sustainable farming community. E-mail pecanlanefarm@gmail.com for tickets. OK, what IS on your Trader Joe's list? Why, it seems like just five years ago that we were tapping our internal feet and waiting for the mystic Trader Joe's to sail into Charlotte. Now we're accustomed to all of it -- the Hawaiian shirts, the ship's bell, the quaint irritation when they run out of raw pine nuts right in the middle of pesto season. Was there ever a time when we didn't speak Jo-Jo and Cat Cookie? In my last post, I asked you to share the things you've gotten at Trader Joe's that weren't up to your standards. Now, as I promised, it's time to share your list of things you always get or seriously love. Judging from the piled-high carts I see when I slip in, some people may have very long lists. So -- if it isn't too rude -- let me ask for your Top 5: The five things you always get when you go. 5. Mandarin Orange Chicken, the one thing my husband and son will make for themselves when I'm out of town. If it's Christmas, my five-list would be: Peppermint Jo-Jo's, Peppermint Jo-Jo's, Peppermint Jo-Jo's, Peppermint Jo-Jo's and Peppermint Jo-Jo's. So what's your 5 list? What isn't on your Trader Joe's list? Yes, there are plenty of things at Trader Joe's that I love. The kalamata olive oil, Mandarin Orange Chicken and frozen jasmine rice all have regular spots in my kitchen. I still mourn the departure of the mojito simmer sauce. But with so many unusual and quirky products, you're going to hit a wrong one occasionally. In a blind tasting of chicken broths in 2008, the one that was dead-last for me was Joe's. It had such a fake taste, I described it as tasting like rubber chicken. So before I ask for a list of the things you always get at Trader Joe's, I wanted to start with the opposite: What didn't work for you? Looking around online, there are poor reviews for chicken lasagne, lobster ravioli and chocolate-covered edamame. I confess their Dijon mustard doesn't have the zing of Grey Poupon, and the cilantro dressing didn't fly for me. Are there Trader Joe's products that you tried once and didn't add to your favorites list? If you keep up with professional baking, you may have seen the name Harry Peemoeller. If you haven't, you have to see what Peemoeller does to get it. The man makes bread dough do things that are a long, long way from your basic PB&J. In baking, Peemoeller is a very big deal. Besides being a senior instructor at Johnson & Wales Charlotte, Harry Peemoeller is a bread sculptor. He's so good at it that he's a team captain for the Bread Bakers Guild USA and a member of the three-man USA National Bread Team, which recently won a spot in the 2012 Coupe de Monde da la Boulangerie, AKA the World Cup of Baking, in Paris. If you work uptown, you can spend your lunch hour Friday watching Peemoeller demonstrate his art from 11 a.m. to 1 p.m. in the Wells Fargo Atrium (inside the building behind the plaza on South Tryon -- if you work uptown, you probably know it better as "the place with Just Fresh and Johnny Burrito"). It's a very different way to spend a lunch hour. Stop by and see. No pimento cheese at the Masters? People in Charlotte got stuck on I-485 for four hours. Some went without power for hours - or are still going without. But Tuesday's big storm really shot a birdy at the South in Augusta, Ga. Without electricity, there was no pimento cheese at the Masters. What's next, Mother Nature? No mint for juleps on Derby Day? No asparagus for Easter dinners? I blame biscuit hypnosis for making me miss Pam Hyatt's fried pies at her market stand A Lil Taste of Heaven at the Charlotte Regional Farmers Market. See, Pam makes these fabulous garlic cheddar biscuits. So when I stop by her stand on Saturday mornings, I'm usually focused on buying a bag of biscuits -- and avoiding noticing all the tempting sweet stuff she has piled up. Hence, I did not notice until this Saturday that Pam also has a rack of fried pies in 11 flavors. How could I miss that? Sorry, Pam. Her fried pies are $2 each, and if you'd like to know more about her baked goods, her Web site is http://www.alitltasteofheaven.com. And don't miss the biscuits. Seriously. There's great food all over this state -- but who can do the driving to gather it all? LynnErin Tyler of Charlotte has a new idea to take care of it, Simply Local at the Atherton Market in SouthEnd, 2104 South Blvd. The idea is that she'll get locally made foods from around the state and sell them at the market. 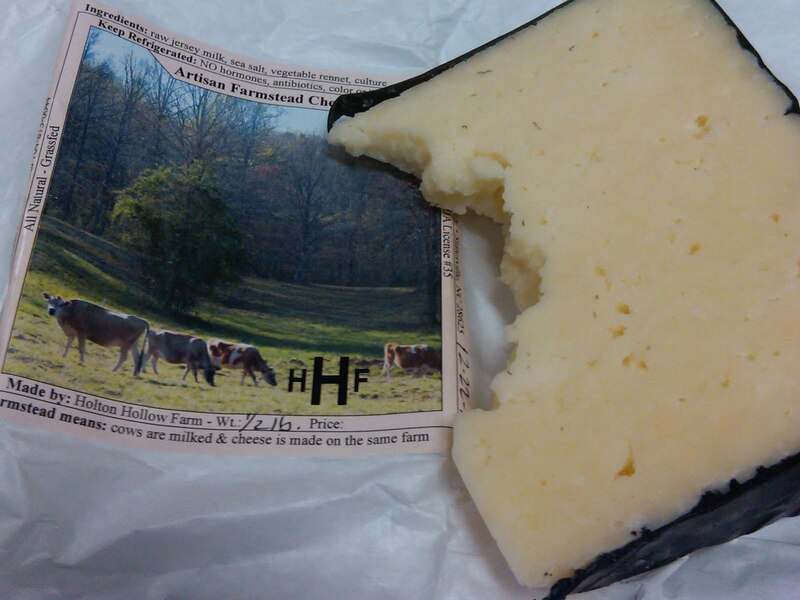 She's starting off with cheeses because there is such a demand for dairy products, including Ashe County cheeses, cow's milk cheeses from Holton Hollow Dairy near Statesville (that's a wedge of their cheese above), Bosky Acres and several others. She's also got a few products such as Imladris jams and jellies (fans of Walter, rejoice). She's hoping to add more products and she'll eventually expand from a table near the front to a larger space that the market is building for her. She also hopes that her stand will enable farmers who can't be at the market for all three days to leave some of their goods with her to handle the sales. She's doing some of the driving to get food herself, and she's also teaming up with services like Leading Green. "It's like a small retail grocery outlet," she says. "Each day, I learn something new about what's available." Prices for the cheeses range from $5 to $8; a 1/2 pound block of Holton Hollow is $8. Look for LynnErin and Simply Local at the market, 9 a.m.-2 p.m. Saturdays, 3-7 p.m. Tuesdays and 9 a.m.-1 p.m. Wednesdays. Elsewhere in farmers market world, this is the last weekend for winter markets at the Matthews Community Farmer's Market, off N.C. 51 in downtown Matthews. Next Saturday, April 9, marks the return of regular hours -- and another step in the market's evolution. There was such a good turnout for the off-weeks this winter that the market is now going to stay open year-round, even in winter. If you stop by tomorrow, you can celebrate by helping Pauline Wood and her crew put up the tents and get spiffed up for next week's return to a full market. Congratulations to Ann Cricchi of Fort Mill. Ann is the winner of the random drawing to give away a copy of "Serve Yourself." Thanks all for playing. And thanks again to author Joe Yonan for tackling the tough topic of cooking for one. If you're paddling around in the food world online today, be careful and note the date. I almost got taken in this morning by the Manhattan User's Guide posting on the Colonel Mustard Food Truck, a condiments-only truck that follows the other food trucks to provide gourmet condiments for your hot dog. It's true: April Fool's is like catnip in the food world. It dates back to the greatest April 1 stunt of all time, the BBC's 1957 report on the harvest of spaghetti trees in Italy. It's still a classic. 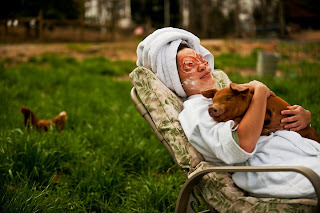 And if I may humbly submit the picture above, I think we did a pretty good job in 2010, when I wrote about the world's first pork-themed spa, in Shanklin, N.C. To get the picture above, photographer Gary O'Brien gamely followed me to Grateful Growers farm in Denver, where Cassie Parsons and Natalie Veres wrangled a piglet for us so we would get a picture of model Michelle Herd with pancetta eye patches and lard facial cream, snuggled happily on a lounge chair plopped down in a pasture. Some things can't be faked, though. See that smile on the pig's face? Gary was fussing with his camera when I looked up and saw this beatific look come over the young pig, nestled in the arms of our model. Scared to startle the pig, I started hissing, "Gary -- shoot the pig! Shoot the pig!" 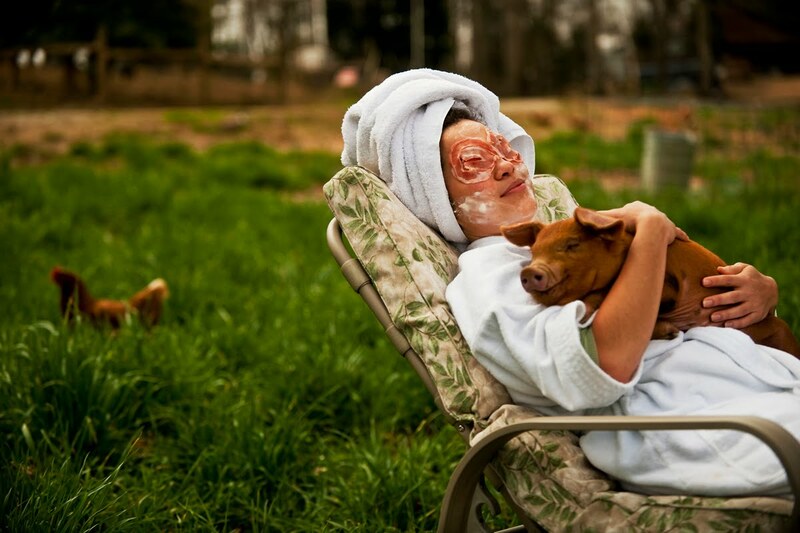 And yes -- our pig spa actually did fool a number of people. Some of them were still contacting me months later, asking for information on how to book a room there.